Gardeners acquainted with perennial herbs in the mint family are familiar with the energetic growth of these herbs. 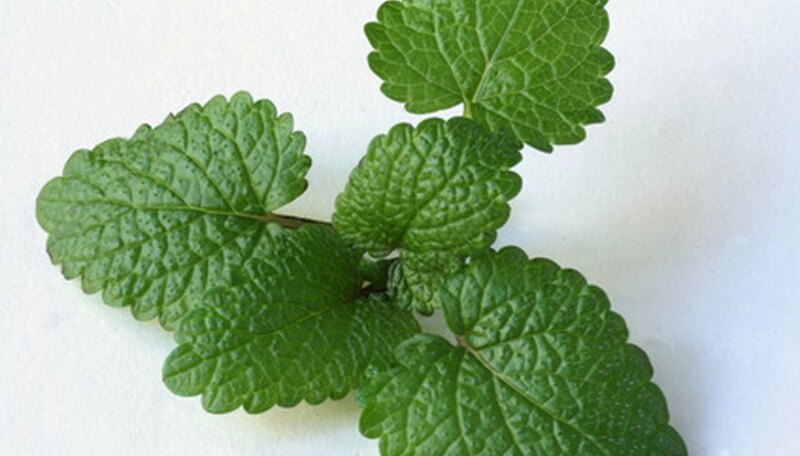 Lemon balm is a member of the mint herbal family and so gardeners growing this herb may experience invasive spreading if they do not control the growth. If your lemon balm grows past its boundaries and you want to remove it, get rid of lemon balm by digging it up and then covering the growing area to smother any remaining growth. Remove the existing lemon balm early in the growing season before it has a chance to flower and produce seeds. Use the hand trowel to dig into the soil and remove every piece of the lemon balm plants from above and beneath the soil. Discard all plant parts directly into the garbage can to prevent spreading the plants anywhere else. Rake the soil smooth with the rake after removing all parts of the plants. Cover the growing area with the clear plastic, making sure you completely cover every inch. Secure the plastic onto the soil with the large rocks. Leave the plastic in place for at least eight weeks. After this time, pull up the plastic and survey the growing area for any remaining growth. Pull any new or remaining lemon balm plants you find and discard them. Check the growing area the following spring for any new lemon balm growth. Pull any growth you find. Replant the area with something new so that the new plants will take over the growing area and choke the lemon balm survivors out. Continue to monitor the area for straggling lemon balm plants and remove them when you find them.